Pagani Zonda Revolucion became one of the expensive hypercars which was once the target of the millionaires who love automotive. Even when it first arrived in 2014, prospective customers who wanted these car had to pay it at price of US. $ 2.2 million or equivalent to Rp. 30 billion. Pagani Zonda Revolucion whose had appeared at the 2014 Geneva Motor Show. Although originating from Italy, the Pagani Zonda Revolucion was used a machine from the AMG Mercedes-Benz. For your information, these 1,070 kg hypercar uses a 6.0 liter V12 engine capable of spraying power up to 789 hp with 730 Nm of torque. With those engine's power, the car is claimed to accelerate from 0-100 km/h in 2.6 seconds with a top speed of 350 km/hour. Of course for anyone who has Pagani Zonda Revolucion, surely they will treat this hypercar very special. 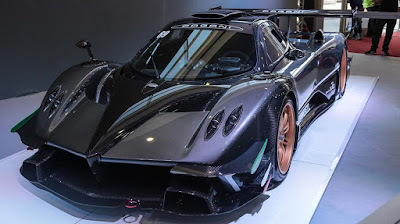 But you know, there is a different and very strange ways to treat the Pagani Zonda Revolucion like it has been done by a rich man named Pablo Perez. As reported by Carscoops, because of his love to these supercar brand, Perez decided to make a perfect work of art. Yes, his Pagani Zonda Ravolucion which has a carbon fiber body made as a separator as well as the wall between the living room with another room. Reportedly also Perez not only had Pagani Zonda Revolucion, but also Pagani Huayra BC. But for Pagani Zonda Revolucion, despite being a display, it turns out that the car is still functioning properly. It's just that, because of these 2013 production hypercar in slanted position, so the car's engine had been removed.